The Jimmy Buffett jukebox musical Escape to Margaritaville has announced a July 1 closing date, ending its Broadway run after just four months. Produced by Frank Marshall, Mindy Rich, Anita Waxman and Beth Williams, the romantic comedy set in a Caribbean island getaway threatened by an erupting volcano has been a modest earner at the box office since it began previews in February, suggesting that Manhattan is not a high-density Parrothead metropolis. Total grosses to date are $9.7 million. While some had speculated that the production might hang on through the summer to attract the tourist crowd who are more likely to be Buffett fans, the box office in recent weeks indicated that the show was running at a significant loss, last week slipping to just 33 percent of its potential gross. Producers have announced a road company kicking off in October 2019 at the Providence Performing Arts Center in Providence, Rhode Island. Despite some love from the critics for guitar-strumming lead Paul Alexander Nolan, who makes an appealing Buffett stand-in, the production came away empty-handed in Tony Award nominations, which is frequently a sign that an under-performing show’s life on Broadway will be terminated. The fact that it hung on for more than a month after nominations were announced suggests producers are using Broadway as a branding opportunity in the hopes of recouping in the regions. Escape to Margaritaville will have played 29 previews and 124 regular performances by the time it closes. 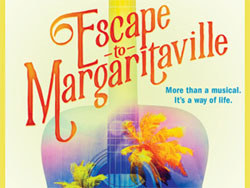 Escape to Margaritaville, the new Broadway musical featuring the songs of Jimmy Buffett, will launch a national tour in October 2019. The traveling production will kick off at Rhode Island’s Providence Performing Arts Center, according to producer Frank Marshall. The musical, featuring a book by Greg Garcia and Mike O’Malley and directed by Tony winner Christopher Ashley, opened at the Marquis Theatre in March after playing pre-Broadway engagements in La Jolla, Chicago, New Orleans, and Houston. Casting and a full itinerary will be announced at a later date.